As a contractor, you’re dedicated to customer service. You want your clients to be impressed with your high-quality work and attention to detail. This means choosing premium products and installing them with meticulous care. You’ll save money by ordering certain building materials in bulk so that you can have them on hand when you need them. If you’ve made the decision to use marble door thresholds and windowsills in your next construction project, then StonExchange may be the right supplier for your needs. We’re focused on customer satisfaction, and we hope to be the ideal solution for all of your marble threshold needs. We also supply retailers around the country, so that you can carry the high-quality inventory that your customers demand. We specialize in marble thresholds and windowsills so that we can bring you the best prices and the finest selection. We’re dedicated to offering high-quality products that are carefully manufactured and polished to perfection. We take pride in our consistent matching, smooth lines and clean edges. We have a wide selection of saddles in stock, so we can provide our customers with faster shipment and lower prices. We also take great care with packaging and shipping our products to minimize damage and help you save money. No two buildings are perfectly alike, which means your sizing requirements from one project to the next will change. This is why we offer a range of stock sizes as well as colors. Whether you need thresholds that are two, four, or six inches across, we have the right product for you. We offer saddles in 36- and 74-inch widths, and they come in heights of 3/8- or 5/8-inches. This allows you to choose the perfect dimensions for your project, and you can also customize the look to suit your particular clients’ needs. Our company caters to the needs of contractors, retailers, and renovation specialists. We’re able to offer low prices by focusing on bulk sales. We don’t offer items by the individual piece, but we’re more than happy to ship out individual crates or full containers based on your company’s needs. We offer our products to retailers and contractors of all sizes, so you can count on us for wholesale pricing. You can place orders as your inventory depletes, or you can set up a recurring order based on your typical sales or client demands. • Travertine is an ideal blend with projects that are using Roman, Iraq, Iroc, Durango or Turkish travertine. The tan color is lightly mottled with shades of cream and ivory, so it will also work nicely with darker colors, including green and brown. • Nuevo White Carrara is a beautiful match for almost any white tile. The brilliant white will stand out nicely against other colors, and the soft gray veining helps to break up the expansive surface. A traditional choice that works in any elegant setting, it also provides a stunning balance to the sleek, dark colors of modern décor. • Crema Sahara Marfil features a consistent page color with light mottling and soft veining. This neutral choice will work in almost any environment, and it’s the best option when you want the thresholds or windowsills to blend into the background rather than demanding any attention for themselves. • Black Granite can be used to highlight the other colors in the space. It can help to clearly define the border between rooms, or it can be used as an accent to bring out other architectural features in the design plan. • Pure white engineered stone is also referred to as Thazoz. This material is impervious to water, so it’s a top choice for bathrooms, pool decks, laundry rooms and other areas that will get wet. It’s manufactured with a beautiful shine, and the smooth white color is not broken by any other shades. In addition to looking for the best prices, you also want to work with a company that cares about your satisfaction. Even in the business-to-business world, service is important. You want to know that your shipment will go out as soon as possible, that it will arrive in a timely manner, and that breakage will be minimized through careful packaging. If you’re in the renovations business, you may not have space to store containers full of marble saddles. While we don’t sell individual pieces to homeowners, we’re happy to send out smaller shipments that better suit your immediate needs. Crates are available for quantities as low as 50 pieces, and you can count on us for fast delivery. This allows you to order new saddles as your inventory is depleted or according to project demands. We’re also more than happy to ship large containers holding more than 1,000 saddles so that you can have the materials on hand and ready to go. We work with businesses of all sizes, including retailers that move more than 3,000 thresholds a month. Whether you’re a large customer or a smaller one, you can count on us for respectful treatment, knowledgeable professionals, wholesale pricing and excellent customer service. You’ll be impressed with our large selection of stock pieces that can be shipped out from our Miami warehouse at any time. However, we also offer custom services. If you need specific sizes or colors that aren’t in stock, we can have them ordered directly from our overseas manufacturing center. The custom orders are cut and polished by the same professionals who handle our regular inventory. You’ll receive the same high-quality saddles along with excellent pricing. We’re more than happy to process your special order, but we ask that you allow us a few weeks to complete the order and have it delivered to your facility. 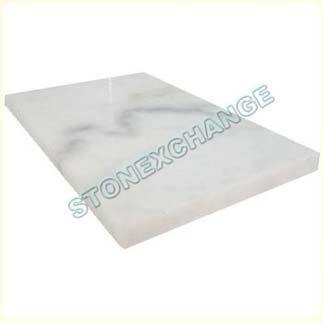 StonExchange is one of the top companies offering marble thresholds and window sills. Our distribution center in Miami, Florida, also carries an attractive inventory of natural stone tile, pavers, and other accessories. Customer satisfaction is our top priority, and we hope that you’ll trust us with all of your marble saddle needs. We’re looking forward to helping you, so contact us today to learn more about our services and inventory. We hope you’ll be impressed with our high-quality products as well as our wholesale prices. Whether you need standard stock item or have to place a special order for an upcoming project, we’re here to help you in any way we can.